This book (Part 02) is attempting to focus on an aspect of patient compliance. Adherence to chronic pharmacotherapy is poor. Medication adherence is an important health issue. To better understand its relevance among vulnerable populations requires the availability of a valid, reliable and practical measurement approach. Researchers have proposed various competing methods, including pill counts and self-report measures. Poor medication adherence diminishes the health benefits of pharmacotherapy. This study is to test the efficacy of a comprehensive pharmacy care program to improve Medication adherence and its associated effects on blood pressure (BP) and low density lipoprotein cholesterol (LDL-C). 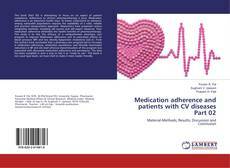 From this authors have concluded that a pharmacy care program led to increases in medication adherence, medication persistence, and clinically meaningful reductions in BP and LDL level whereas discontinuation of the program was associated with decreased medication adherence and persistence. The data has been compiled in such a way to feel it as “ready to use”. This book is not usual type book; we have tried to make it more reader friendly.